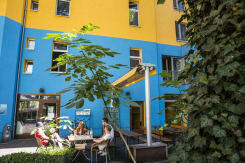 Pegasus Hostel Berlin offers rooms with 1-9 beds with a total capacity of 200 beds. 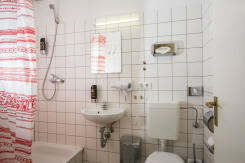 All rooms have high ceilings, typical of Berlin\\\\\\\'s \\\\\\\'Altbau\\\\\\\' buildings, and are sunny and quiet. There are showers on every corridor. 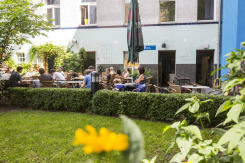 Pegasus Hostel is located in central Berlin, just 5 minutes walk from the Berlin Wall as well as the nearest the overground (S-Bahn) and long distance train station - \\\\\\\"Ostbahnhof\\\\\\\". We have free internet access, bed linen, luggage room and a fully equipped kitchen for our guests\\\\\\\' use. We sponsor daily free walks in various languages for our guests! 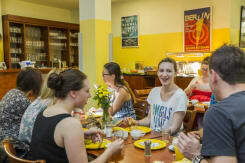 2 - Please note that due to German law children under 16 years of age are not allowed to stay in dormitoriesUnder German law, children under 16 years of age are not permitted to stay in dormitory accommodation. 2 - You can store your luggage in our luggage room without getting charged before check in or after check out. 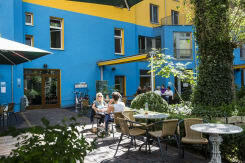 3 - There are free parking possibilities in the close area where our Hostel is, like Frieden Street. We will inform you about parking when you Check in. 4 - There is 4% transaction cost when paying with Visa or MasterCard. 5 - Please note that guests under 18 years or over 40 years are not allowed to stay in dormitory. 6 - We have different payment and cancellation policies for the bookings more than 10 beds.